Heat olive oil in heavy stockpot. Saute onion, celery and fennel over medium heat until softened, about 5 minutes. Add garlic, basil, tarragon, red pepper flakes, pepper and bacon; saute for 3 to 5 minutes. Add clam juice, tomatoes and wine; simmer 10 minutes. Rinse any ice glaze from frozen Alaska Seafood under cold water. Turn off heat and add seafood to liquid, skin side down. Return heat to a simmer. 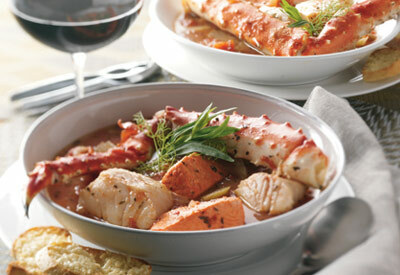 Once simmering, cover pan and cook 4 to 5 minutes for frozen seafood or 2 minutes for fresh/thawed fish. Turn off heat and let seafood rest 5 minutes or until opaque throughout. To serve, ladle into warm soup bowls.